The final trailer for the 3D fantasy epic The Monkey King <西遊記之大鬧天宮> was released online on January 24, 2014. The action film, a co-produced between Hong Kong and mainland China, is directed by Cheang Pou Soi (鄭保瑞) and features an ensemble superstar cast including Donnie Yen (甄子丹), Chow Yun Fat (周潤發), Aaron Kwok (郭富城), Kelly Chen (陳慧琳),Gigi Leung (梁詠琪), Joe Chen (陳喬恩), and Peter Ho (何潤東). The Monkey King is a retelling of the origin of Sun Wukong, the protagonist of the Chinese classical novel Journey to the West <西遊記>. According to legend, Sun Wukong, a monkey born from a stone, rebels against the Heavenly Kingdom after the Jade Emperor demotes him to a stable boy. To maintain order, the Jade Emperor brings together all the spiritual forces of Heaven to capture Sun Wukong, who single-handedly defeats 100,000 celestial warriors. With the help of the Buddha, Sun Wukong ultimately gets imprisoned under a mountain. Five centuries later, Sun Wukong is offered to serve as the disciple of the monk Tang Sanzang. Donnie Yen, also the film’s action choreographer, stars as Sun Wukong. Chow Yun Fat stars as the Jade Emperor, while Aaron Kwok and Joe Chen respectively star as the Bull Demon King and Princess Iron Fan, a pair of lovers with divided loyalty. Peter Ho portrays the great warrior Erlang Shen, the nephew of the Jade Emperor. Kelly Chen portrays Guan Yin, the deity who brings Sun Wukong out of his dungeon so he can assist Tang Sanzang. Gigi Leung portrays Chang’e, the moon goddess. Zhang Zilin (張梓琳), 2007 Miss World winner, is introduced in the film as Nuwa, the mother of mankind. Eddie Cheung (張兆輝) makes an appearance as the pagoda-bearing Li Jing, while Carlson Cheng (鄭家星) and Him Law (羅仲謙) star as Li Jing’s two sons, Li Nezha and Li Muzha, respectively. 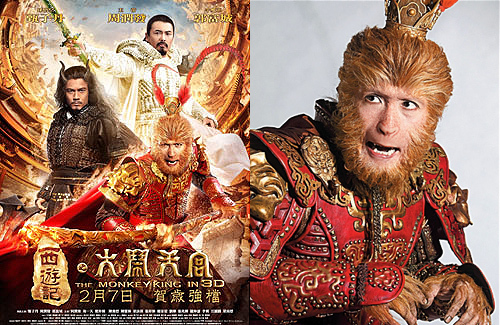 The Monkey King will be released on January 30, 2014 in Hong Kong theaters. too much graphic,,, too much power of the monkey king…. I will pass this movie in the theater. The whole visual is making my head dizzy. Am I the only one or do I feel like aside from the 3 A-list, the girl who plays the bull’s wife gets the most media coverage among the whole ‘keh leh feh’ crew. I see reports on her and the Bull everyday, but Kelly Chen and Peter Ho etc. are rarely promoted at all. What’s going on mang, i wanna see Him Law! You mean Joe Chen? Well, she’s been quite a hot topic these days with her success in the mainland market and such. Also, she’s the only one that is paired up with one of the main cast and Aaron Kwok seems to mention her a lot in front of media… she’s lucky I guess. Joe Chen is a chinese entertainment hottie. The CGI in this movie really bothers me. There seems to be too much moving parts, yet too little focus on the quality. I hope it doesnt turn out like Storm Riders 2/ Storm Warriors. Oh wow CGI still looks horrible XDDDDD! The flame effects on wukong between 1:48 – 1:52 was cringe worthy. You might as well use real fire. WOW. awesome CGI, picturesque scenes, cool action sequences. The best I have seen in any Chinese movies so far and it is definitely a major leap in CGI development in the Chinese movie market. I believe this movie will do very well in the box office. i will be watching this 3d at my local. That was definitely not Donnies own voice, although Aaron’s is authentic. I’m surprised this movie will be released in Cantonese since mainland China had a hand in producing the film. Kelly Chen look really good in her role. The trailer looks good. Can’t wait to see it. Will look nice on the big screen. Looks great! Way too much computer graphics, but I always look Journey to The West! what a cast.. so many Superstar! Gosh. The trailer was so bad.